What’s most interesting about the word is that the goalposts that represent value keep moving. Five years ago, a person who wouldn’t have dreamed of buying a TV costing Rs 60,000 is the same person who’s now kitting out their living room with a home theatre system. Value for money, therefore, is both a constant (in terms of being a core concept) as well as a variable, in terms of the boundaries that encompass it. The cars you see here, the Mercedes-Benz B-Class and the Audi Q3, aim to take advantage of this fact, slotting themselves into the market as luxury products that also provide comparative value for money. 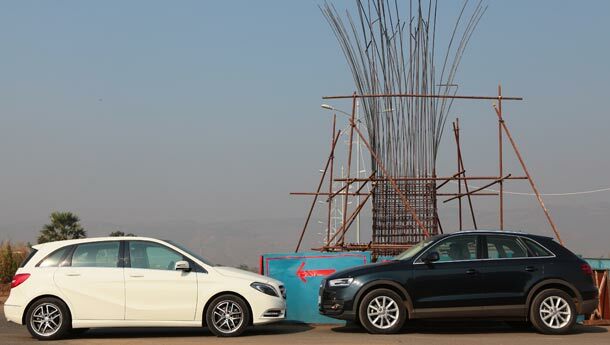 Both manufacturers want to catch ‘em young, as it were, and attract newly affluent buyers into the fold and hopefully keep them there – let’s see how the cars stand up, and if the Q3 can hold on to the crown it won after beating the BMW X1 in our previous shootout. 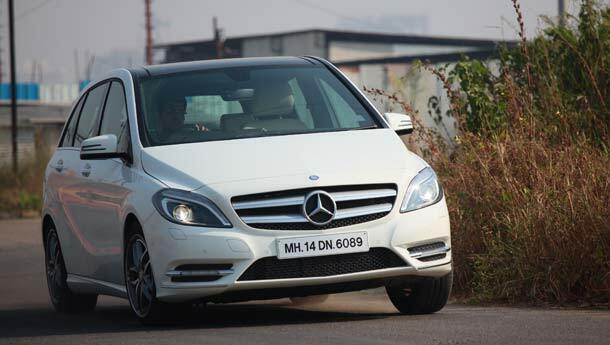 The all-new B-Class, which shares the same platform as the smaller A-Class, aims to right the wrongs of its predecessor, which saw lukewarm critical and sales success. To begin with, even though the basic outward design has not changed radically, engineers have managed to reduce its drag coefficient to a commendable 0.24, despite the fact that it sits so upright; the unique ‘sandwich floor’ of the earlier model has also been done away with, leading to the car sitting lower on the road. The car slots somewhere in the middle ground of being a hatchback and an MPV (Mercedes is pitching it as a ‘Sports Tourer’) – it’s larger than your average hatchback, and smaller than most large MPVs, as a result of which it looks a little bloated; the upswept creases on its flanks contribute to this effect, although they help to make the car more aerodynamic. It would be a stretch to call it good looking – ‘unusual’ is more like it, and it does have a certain presence on the road. The Q3? 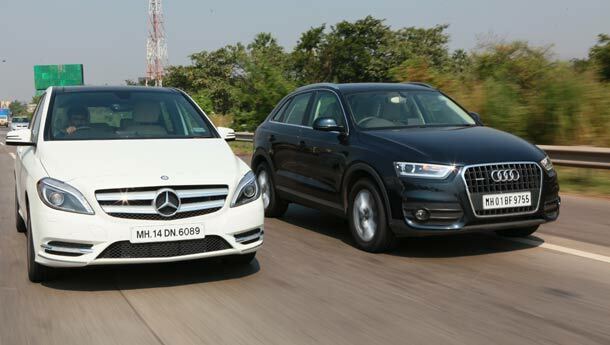 Well, if you can tell it apart with a quick glance from its older brothers, the Q5 and Q7, you have a keen eye. Having said that, it’s a very stylish car that holds together as a cohesive design better than the B-Class. Looked at in profile, it has a coupé-ish silhouette, and the overall effect is that of a dynamic vehicle – the short wheelbase and wide track contribute to this immensely. The typical Audi flourishes of the grille and LED lighting look great, and this is the better looking car, although it could have been made to look much more fresh – Audi missed a trick here, I think. The B-Class’ core strength is the way it has been packaged. Due to its low stance, it is very easy to get in and out of it, and once inside, you will find a spacious, airy and stylish cabin. Its 2.7-metre wheelbase, combined with the low floor and the low glass lines, give it plenty of leg and head room, and three people can sit quite comfortably in the rear seat, which also folds flat for extra storage space. 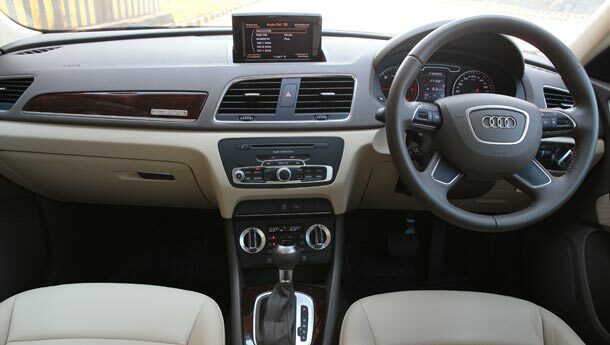 In the B180 Sport that I drove, you get well-crafted leather seats, Bluetooth, USB and AUX-in, snazzy chrome AC vents, a multi-function steering wheel, a reversing camera, bi-Xenon headlamps and a host of other features; the base B180 isn’t quite as well loaded. Fit and finish is of a very high level, overall, in keeping with Mercedes standards. In terms of practicality, the car is a mixed bag; while the hatch space is huge and easily accessed due to its low floor, it is also compromised because of the presence of a space-saving spare wheel. This wheel cannot be stored under the false floor of the storage area, because the inclusion of a tyre-inflation compressor there takes up too much space. Luggage space, or the advantage of having standard tubeless tyres as opposed to runflats? You decide! The Q3 concedes some rear seat space to the B-Class, but in every other respect, it is just as well finished, loaded and put together, and is more practical as well because of the fact that its 460-litre hatch space isn’t compromised by a spare wheel, like the B-Class. I particularly liked the AC controls, which are rocker dials rather than the usual switches, and the manually operated MMI screen on the dashboard looks as good as those on more expensive Audis. Under the B-Class’ hood, you will find a surprisingly small (for a Mercedes) engine. Currently, the car is only available with a 1.6-litre, turbocharged, direct injection petrol engine with VVT, which puts out 121 bhp@5000 rpm and 20 kgm@1250-4000 rpm. With start/stop technology and three driving modes (Eco, Sport and Manual), it’s not exactly a barnstormer, but it has its strengths – low down performance is sprightly (the turbo really helps here), and once you’re cruising at highway speeds, the motor is relaxed. The 7-speed dual clutch transmission is also tuned mainly for refinement and smoothness, although it holds revs for appreciably longer when in Sport mode. The performance numbers are quite respectable – 0-60 kph comes up in 4.5 seconds, 0-100 kph in 10.5 seconds and the 80-120 kph overtaking manoeuvre takes 7.1 seconds. 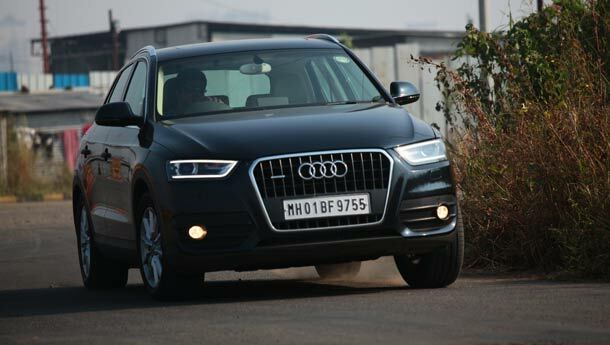 The Q3 takes this round quite comfortably, there’s no doubt about it. The 2-litre diesel engine that powers it (the only one on offer currently) also finds a place in cars like the A4, the Q5 and the VW Passat, but in this application, there’s more shove on offer. It is far more powerful than the B-Class’ engine, with its 177 bhp@4200 rpm and 38.74 kgm@1750-2500 rpm, and the numbers show it – 0-60 kph in 3.11 seconds, 0-100 kph in 8.6 seconds, 80-120 kph in 6.2 seconds. 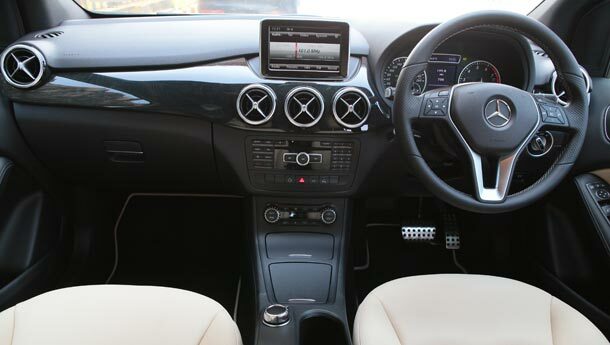 More importantly, it is both easier and more fun to drive than the B-Class; like the B-Class, its 7-speed automatic gearbox is also tuned for smoothness and refinement. 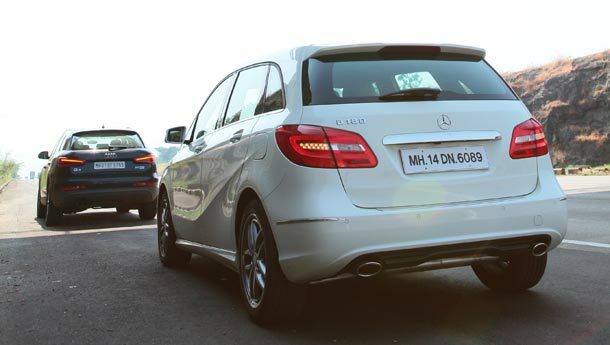 The B-Class offers a level of handling that is one step above any other hatchback, premium or otherwise. Although its electrically powered steering unit isn’t very lively, if you really push the car through a series of tight corners, it grips surprisingly well and with a lot of confidence, for a front wheel-driven car. Undulations in the road are ironed out well enough to keep occupants happy, although it does tend to become a bit bumpy at the back over a series of potholes – this improves if there is more weight on the rear axles. Good as the B-Class is, the Q3 is better still (apart from its too-soft steering feel). Quattro makes all the difference here, even though the system is biased towards the front axle – around tight, fast corners, the Q3 simply grips and goes, in a very car-like fashion. Its ride quality, though on the firm side, is more settled than that of the B-Class; in either case, if a really plush ride for your derriere is absolutely paramount, then you need to look at a more expensive SUV than these two.